The combined use of a small shield (the buckler) and a short sword is one of the world's oldest techniques for close combat. Often considered as simply a fighting technique of the 14th and 15th centuries, the use of this small shield as a complement to the main weapon goes back to antiquity. Much later than the middle ages, there is still lots of evidence that this deadly combination was used to great effect in Renaissance rapier duelling. Few weapons can boast such a long period of activity. 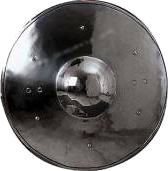 Small shields were used by men-at-arms from all continents in Europe and Asia, in the warrior-tribes of Africa and in Latin America (see also : Targa, Umbo, Schildbuckel, Darga). The term Swashbuckler invented by Hollywood film producers is inspired by the movement and sound of a sword Swashing while using a buckler. Its ease of use and light weight make the buckler an ideal infantry weapon. A foot soldier has to carry his fighting equipment with him and must be able to move quickly at short notice. The quantity of arms and armour were therefore very limited. During close combat, a buckler provided an advantage over one's opponent without getting in the way of cut and thrust sword techniques. A buckler is a single-handed weapon and can be used in both defense and attack. Bucklers were made of wood, leather but more often of steel and were sometimes equipped with one or more sharp dagger-type points protruding from the centre of the shield. The buckler was usually round in shape and measured between 20 and 40 centimetres in diameter. The centre of the buckler was often rounded and protruding in such a way as to deflect attacks from the enemy. The edge could be folded forward with the aim of stopping a sword thrust and possibly even breaking the opponent's blade. Sword and Buckler Schools sprang up in Europe during the late middle ages and could be compared to martial arts academies - training students how to use both weapons together efficiently. A great deal of illustrations show the buckler in its various forms, throughout the ages and across many countries. 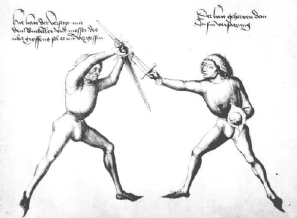 The Fechtbuch of Hans Talhoffer (1467) contains a certain number of illustrations (231-239) of men-at-arms practising the art of the sword and buckler. The Walpurgis Fechtbuch I.33 and the treatises of Liegnitzer, Wilhalm and Kal also mention the buckler. Strangely enough, no mention is made of the buckler in the famous Flos Duellatorumwritten by the fencing master Fiore dei Liberi. Of course the buckler was a standard piece of equipment among archers of the 14th and 15th centuries. A buckler carried around the waist in no way impedes the movements of foot-archers and above all, does not hinder the action of shooting the longbow. When combat distances no longer allowed effective use of the longbow, the sword-and-buckler combination transformed scores of archers into highly-effective men-at-arms most of whom were trained in the use of these weapons. What sword would be used with a buckler ? Most period texts and illustrations, depict men-at-arms using short-bladed or single-handed sword in conjuction with the buckler. Some central-European soldiers preferred the falchion as the main weapon. Examples can even be found of bucklers used with hand-and-a-half swords or even lances although the technique must have been entirely different due to their weight and centre of gravity. Many references from the Renaissance period show duellists using a rapier and buckler. Why then did such a popular combination of weapons disappear? In my opinion, it was not so much the shift towards thrusting techniques in fencing that was to put an end to the sword and buckler, but the overwhelming use of firearms on the battlefields of the 16th century. The upheaval and drastic change in military strategies caused by the introduction of firearms meant the death of so many traditional weapons and techniques which survived only in the limited area of duelling.